The original version of this article, by Chris Berdnik, appeared on the Pulitzer Center on Crisis Reporting. I meet Keo Mao, 42, in the floating fishing village of Akol on Cambodia’s Lake Tonle Sap. The houses here move seasonally with the lake, which expands by a factor of five during the monsoon rains and recedes again in the dry months. Fish supply about 80 percent of the animal protein eaten by Cambodians, and about 60 percent of the inland catch comes from the Tonle Sap. Mao is baby-faced, with a thick mop of dark hair and a ready smile that crowds out his other features when fully displayed. His stubby-fingered hands are heavily calloused from decades of work on the water. He’s not fishing the day we meet, however. Along with a few other local fishermen, Mao earns some part-time cash by helping Conservation International track the health of the lake and its fish. They collect fish from sample nets set around the lake and take notes, recording the species, size, and weight, and snipping off a bit of tail to be shipped off to a lab at Texas Tech for DNA analysis. The rest of the time, Mao’s out on the lake – setting his net in the evenings and hauling it back out early the next morning. He doesn’t need science to know the lake is in trouble. Continue reading on the Pulitzer Center. 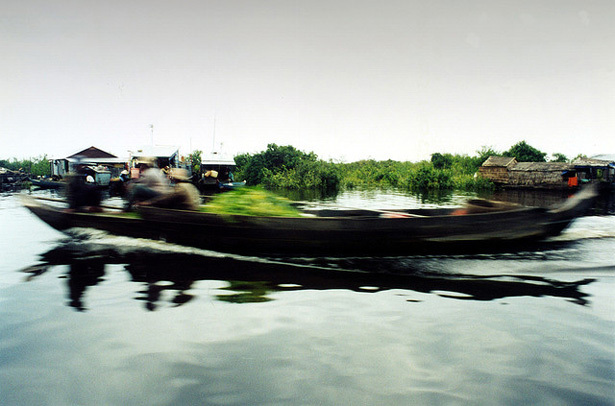 Photo Credit: Boat the Tonle Sap, courtesy of flickr user Starpoke.